Green ginger wine makes a great refreshing cocktail with lime and fizzy water. I also use it for oriental cooking.when I am out of Chinese cooking wine. Stone's is nice. I also like Lidl's (silly me! just remember it's Aldi not lidl) own brand but it is only available around Christmas time. This stewed pork recipe was created when I had a bottle of old ginger wine to use up quickly. I was pleased how flavourful it was. 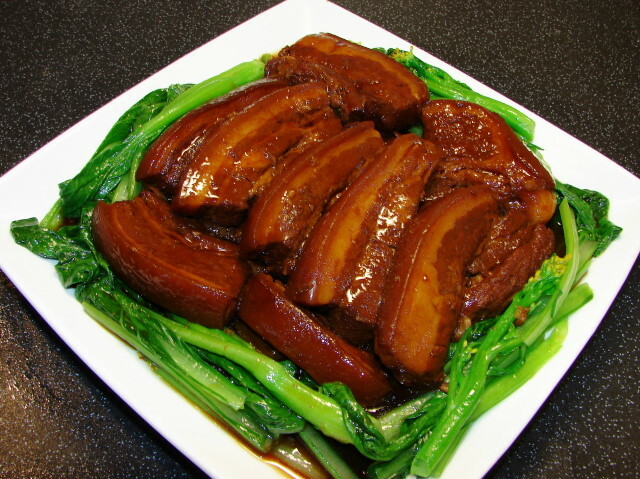 It's similar to hong shao rou but packed with wine flavour. *You can also use half belly and half spare ribs. ** I don't normally add garlic with this stewed pork, I find garlic is too strong masking the flavour of the ginger wine. If you really want to add garlic, add few whole cloves with the skin on. Blanch pork in boiling water for about 1 - 2 min till meat has turned white. Remove and rinse under the tap to remove any scum. Take a medium size pot that will hold all the pork (preferably clay pot or heavy bottom pot). Line the pot with all the spring onion then the ginger slices and the rest of of the spices. Lastly lay the pork pieces on top. Add dark, light soy and vinegar. Finally pour in enough ginger wine to almost cover the meat. Gently bring the temperature of liquid to near boiling at medium heat. Keep your eye on it, do not let it boil over. Cover with the lid ajar (to let the liquid reduce) and simmer at low heat for about 2 hours or till the meat has become very tender. Regular checks to ensure the liquid is not boiling over and turning the meat pieces if necessary to immerse in the sauce. If liquid is drying up too fast add more wine or water during simmering. When meat is tender enough, skim off the fat floating on top of the sauce. Mix few tbsp of ginger wine with 1 tbsp of cornflour. 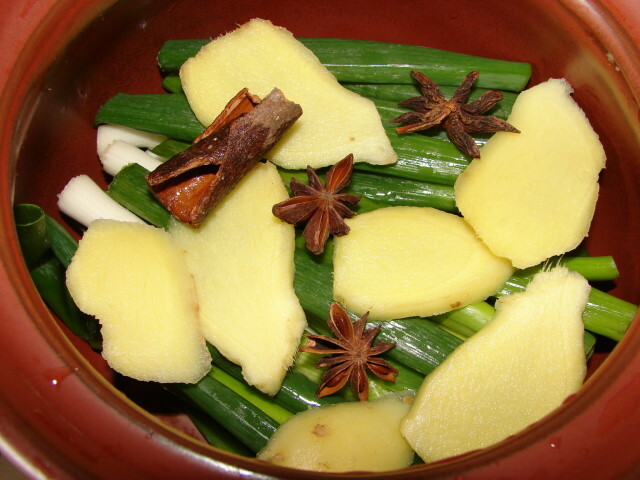 Stir this into the sauce and cook briefly till sauce is lightly thicken. Leave the cooked meat to rest for a while before serving. I also blanched some choi sum to soak up the sauce. Add a little cooking oil to the boiling water will keep the veggie green and glossy. Ooh, what a good idea. I've added a bottle of Stone's to my shopping list! Not sure about mulled wine. Can give a try or save it to poach some pears. Cholesterol-check on hold. I will try this! I'm not much a fan of pork, considering my diet for age and all. But I have to say, this looks mouth-watering! Tried this last night and it was very good — thanks! Thanks for the feedback kake. Glad you like it. I used an English green ginger wine for this recipe. If you cannot find this, you can use half shaoshing and half glutinous rice wine. Thanks...I think I will do this for my uni mates' gathering...We usually have a theme ..e.g. 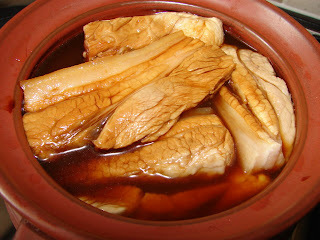 "Autumn Leaves" (everything wrapped in leaves)..Nyonya ..this time round it is "cooked in wine" .What a wonderful idea!! Hi - not sure the comment was left. Just wanted to share the tip that you can get Stone's ginger wine at Asda all year round. I got a bottle a few weeks ago at the Asda in Greenwich. Appreciate the comment. These readers who can't find Stone's may be from the far east or other countries where Stone's is not easily available.